The V200E accept the traditional two wire, 4-20mA input signal and is available for use on rotary or linear applications. The V200E utilizes a unique spool valve, is a cam characterized, forced balanced instrument that is simple and rugged. The V200E have a pre-calibrated internal IP converter which uses the actual supply air pressure, filtered through a specially designed filter. The IP converter then converts this pressure via an electrical signal to a 20-100kPa / 3-15psi signal back into the positioner signal diaphragm chamber for mechanical positioner response. With a rugged IP66 / NEMA 4X die cast aluminum housing and an electrostatically applied polyester coating the unit has an excellent protection against a wide range of environmental conditions. Standard features like the external zero and span adjustment makes this positioner very user friendly for calibration and maintenance. The large indicator has scaling to operate in both direct and reverse directions. With the unique snap in drive shaft design the unit can be used for versatile mounting to various actuator applications. The gauge block is cast into the housing and therefore standard. 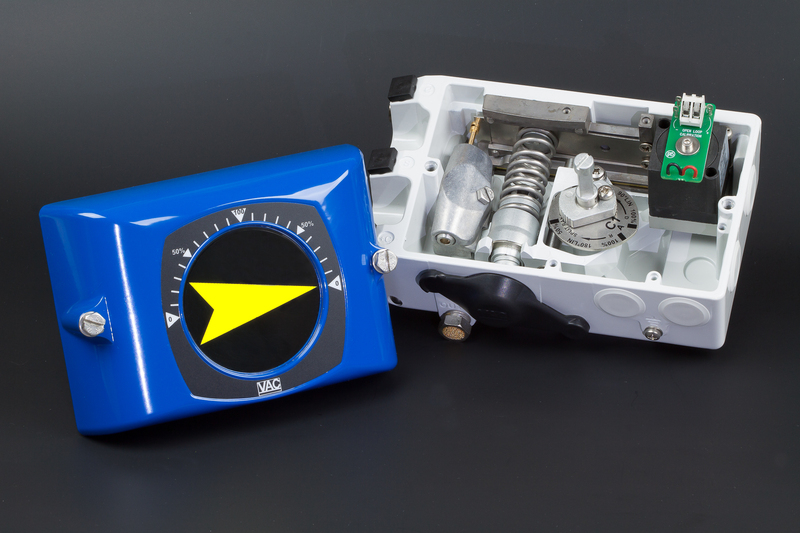 Options like special cams, dome indicators and more are available. The V200E could be viewed as the first step in building the “all in one” positioner, one of the key features of the V200 series. The IP converter module can be added anywhere from the factory to the field which give this product full flexibility.